Finding manufacturers at the cutting edge could reveal promising investment opportunities. But before scouring the markets for promising manufacturers, it's important to understand the basics of the sector. Manufacturing is at the heart of innovation. As companies continue to look for ways to become more frugal, improve quality, and optimize operational efficiency, material-reliant businesses will look to manufacturing to carve out key competitive advantages. Finding manufacturers on the cutting edge, therefore, could reveal some promising investment opportunities. But before scouring the markets for promising manufacturers, it's important to understand the basics of the sector. "The Manufacturing sector comprises establishments engaged in the mechanical, physical, or chemical transformation of materials, substances, or components into new products," according to the Bureau of Labor Statistics. More specifically, in the manufacturing sector, you'll find plants, factories, and mills that typically operate automated machines and equipment alongside factory workers. Manufacturing may be 100% vertically integrated, or a manufacturer may outsource the processing of some of its components with other businesses. Examples of manufacturing businesses include solar panel manufacturers, chemical manufacturers, textile product mills, metal manufacturing, and petroleum and coal products manufacturing. How big is the manufacturing industry? There's no way to really overstate the importance of manufacturing in the economy. Today, manufacturing represents about 16% of the global GDP, according to a 2012 McKinsey Global Institute study on the manufacturing sector. Or, here's another way to put it: After lumping together the top 500 U.S.-based manufacturers in 2012, total annual revenue exceeds $6 trillion. An article on Free Enterprise, the U.S. Chamber of Commerce's online magazine, has noted that this batch of manufacturing companies alone would rank as the world's third-largest economy, behind the U.S. and China, but ahead of Japan with its 2012 GDP of $5.98 trillion. The operational aspects of manufacturing businesses vary widely from one kind of manufacturing to another. But here are some general rules of thumb about manufacturing companies. Most forms of manufacturing, due to a heavy reliance on machinery, plants, and resources, are highly capital intensive. This also has an effect on barriers to entry, often making them high. R&D intensity is high for manufacturers competing globally and medium for those competing regionally. This likely has much to do with the global companies lacking the same powerful market monopolies that some regional players may have. The newest and most rapidly evolving operation aspect of manufacturing is the importance of information technology to the sector, often referred to as "big data" in the manufacturing environment. "Major information technology trends such as big data, advanced analytics, social technologies, and the Internet of Things all can be harnessed in supply chain management and other aspects of manufacturing," reads the 2012 McKinsey report. What are the drivers of the manufacturing industry? Economic conditions are a major driver for the manufacturing industry. 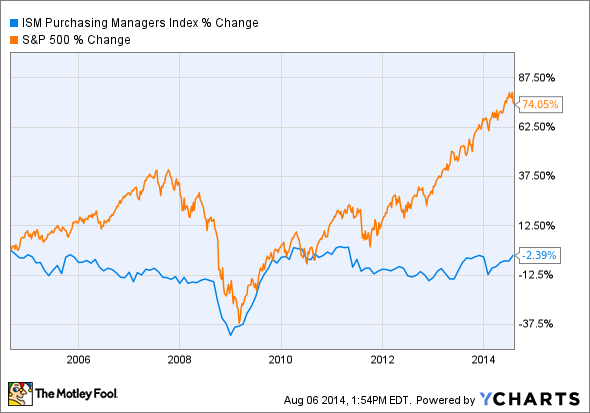 Consider the volatility of the purchasing managers index during the 2008 and 2009 recession compared to the volatility of the S&P 500. The index is an indicator of the economic health of the manufacturing sector and is based on five key indicators: new orders, inventory levels, production, supplier deliveries, and employment environment. During bad times, the index plummets. During good times, the index soars. Why is the economy such a major driver for manufacturing? It can be traced back to two key reasons. First, access to capital -- both equity and financing -- is more costly during tough times as banks and investors become more conservative. And given the high capital intensiveness of manufacturing businesses, large sums are often required to take on new projects, expand capacity, increase production, or retool and revamp a current factory. Second, global consumption may slow, or even decline, when the economy suffers. Consumption is a closely followed metric in the manufacturing industry because consumption directly (through direct consumption of manufactured goods) and indirectly (through creating demand for capital investments that, in turn, boosts demand for manufacturing) impacts the health of the manufacturing sector. Different manufacturing sectors are tied to different consumption metrics. U.S. defense manufacturing companies are driven by U.S. defense consumption of manufacturing goods, steel manufacturers are tied to steel consumption, etc. Looking at the global manufacturing market, meaningful growth in global GDP indicates that the global manufacturing sector will likely be healthy.